Find Appliance Parts at Our New Look Website! What could be better than starting out the new year with a newly redesigned, easy-to-navigate new web site? Not much, if you ask us. We’re Appliance Parts Company and we’re thrilled to have a new look website for our nationwide customers. Haven’t heard the name? Appliance Parts Company has one of the largest selections of appliance parts on the internet. That’s a direct result of our partnering with some of the biggest names in the household appliance business. From General Electric to Maytag, Whirlpool to Viking, our company can help you with appliance replacement parts, advice and warranties from these leading manufacturers. Appliance Parts Company offers appliance parts and installation products from 13 locations in the U.S. serving markets in Arizona, Nevada, Texas and Utah. While we offer counter sales, phone and fax sales from all our locations, we most regularly ship across the U.S. reaching most destinations in two days or less. 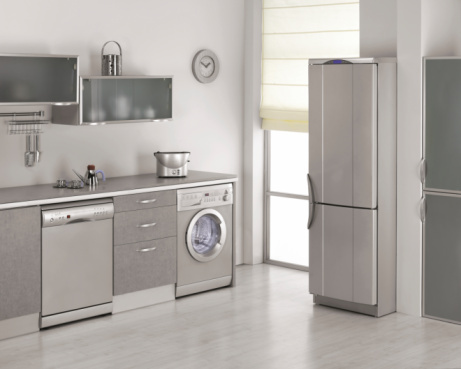 We represent and carry parts for almost all brands of major home appliances. Need new parts for your dishwasher? Our range of replacement appliance parts runs from bearings, fans and belts, to drain hoses, gaskets, seals and more. Refrigerator need parts? We have replacement drawers, shelves, ice makers, door handles and more. An exciting part of our business development is to align Appliance Parts Company with outside organizations that have access to a database of parts around the country. One of them is with the Appliance Parts Distributor Association. The group offers an Appliance Part Finder (APF). Head over to your appliance’s manufacturer site, or even to our site, click on the APF link, and enter the part search term or part number that best fits your necessary replacement appliance part. The service will search the Appliance Parts Distributors Association entire North American inventory. Once you see where the part is available, you can work with your local distributor like Appliance Parts Company to source the part and make the service call. It’s fast, efficient and offers customers a great way to avoid costly repairs on still functioning appliances. If you don’t see what you are looking for, call us on 1-800-293-2726. Our product professionals will assist you in getting the product required or suggest alternatives. We can provide information and ordering assistance on thousands of products. This entry was posted in Appliance Repair Parts and tagged appliance parts for refrigerators, appliance repair parts, appliance thermostat, household appliances, refrigeration equipment, replacement appliance parts. Bookmark the permalink.